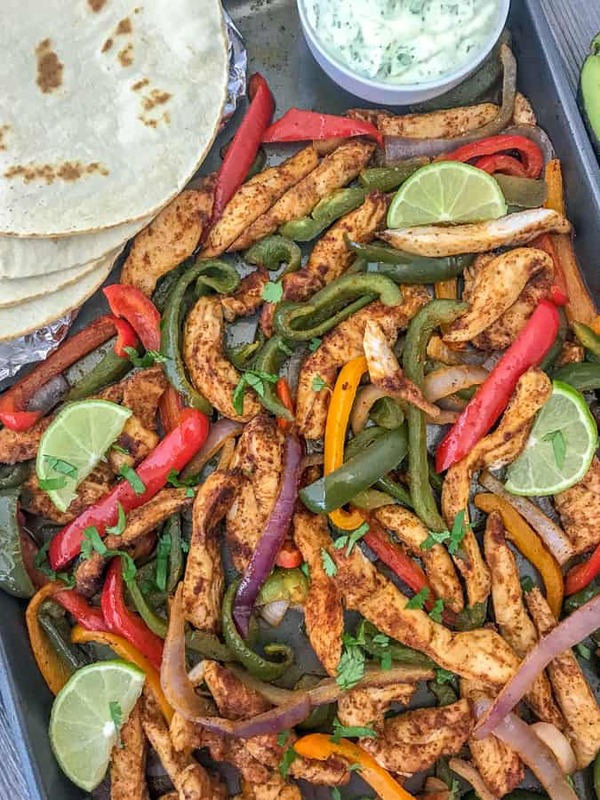 These Simple Sheet Pan Chicken Fajitas are a breeze to make and absolutely delicious! 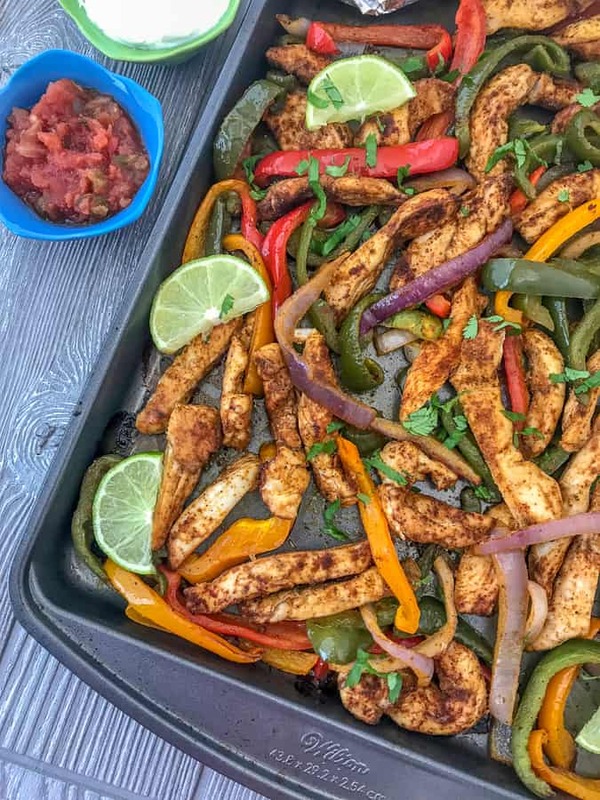 Strips of seasoned chicken breast, a colorful array of bell peppers and onion all tossed with olive oil and spices – right on the sheet pan. Minimal effort and an easy clean up! Top this with freshly chopped cilantro, a fresh squeeze of lime juice, and serve it with my Creamy Cilantro Lime Sauce and you have a party in a tortilla in no time! 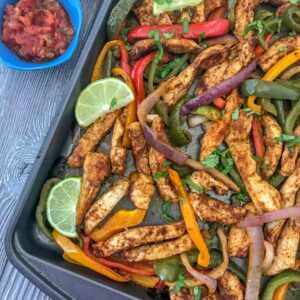 Be sure to add this recipe to your meal prep list this week with my Chicken Fajita Salad Meal Prep. Easy to clean up – simply use parchment paper or aluminum foil that can easily be removed and discarded. Note: parchment paper is not safe at 425 degrees F or above. Do not broil anything with parchment paper on the sheet pan! Ask me how I know… 😉 WHOOPS! 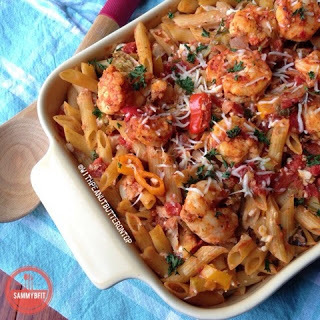 Everything comes together and cooks on one pan, requiring minimal effort. They are not limited to dinners! You can make all sorts of desserts and breakfasts on them – such as my Easy Sheet Pan Breakfast Potatoes. They are great for meal prep, as you can roast meats and vegetables together or separately. Roast as little or as much as you need to prep! Preheat the oven to 400 degrees F and line a baking sheet with parchment paper. Or spray with nonstick cooking spray, if preferred. Start by slicing the red onion and the bell peppers into 1/4-inch slices. If you like them to have a little extra crunch, slice them thicker. 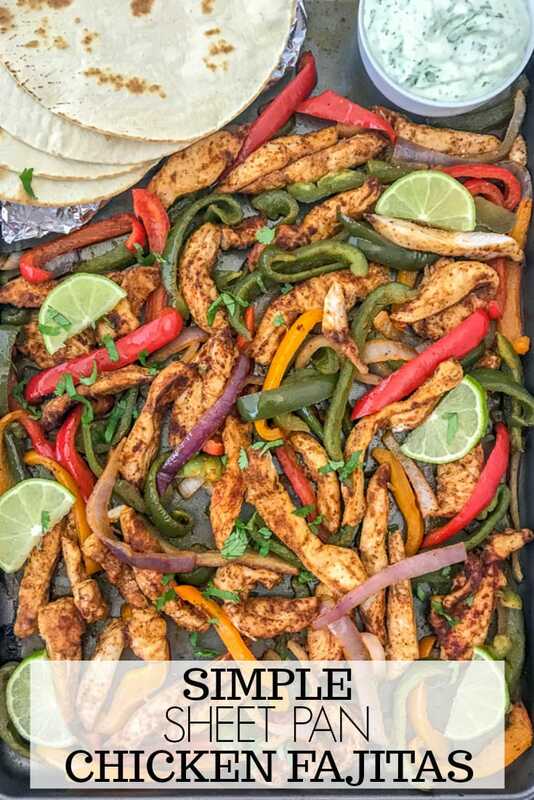 Toss the peppers, onions, and sliced chicken with olive oil and seasonings – either in a large mixing bowl or on the prepared sheet pan itself. Roast for 20-25 minutes, stirring/tossing halfway, ensuring the chicken has reached an internal temperature of 165 degrees F on a meat thermometer. MORE TACO TUESDAY RECIPES YOU WILL LOVE! 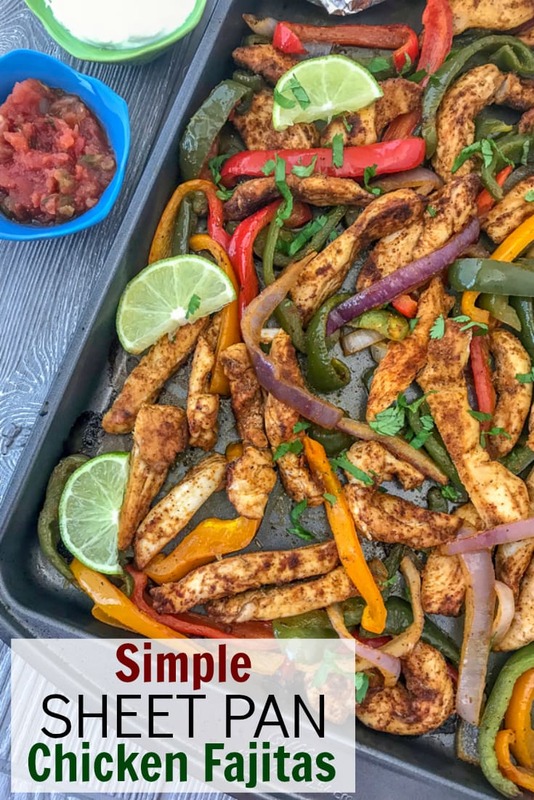 Sliced chicken breast, bell peppers, and onions that are all tossed together on a baking sheet with olive oil and spices. Baked in the oven until tender perfection. 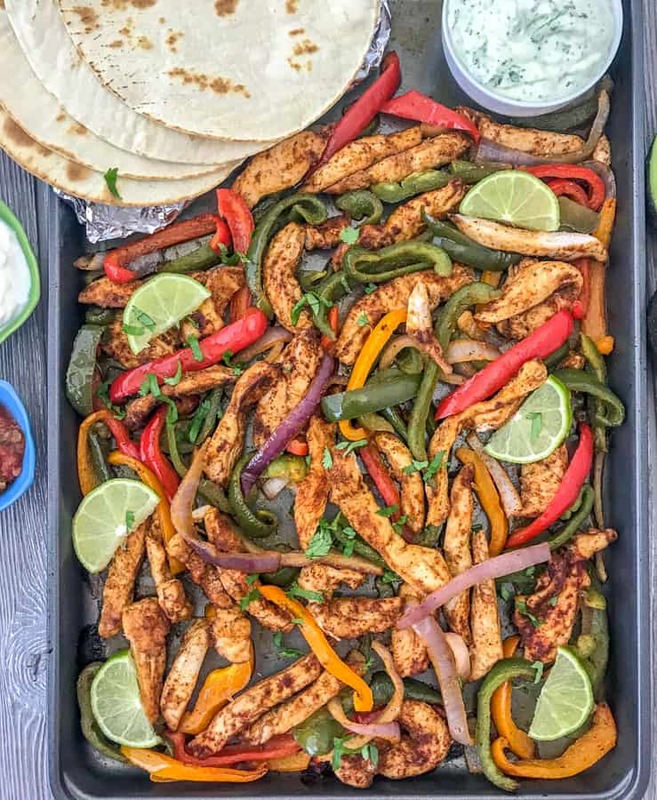 Served with fresh lime juice and my favorite Creamy Cilantro Lime Sauce, making for the most flavorful sheet pan meal! Halfway through roasting, place a small non-stick pan over low heat. Once the pan has heated, add one tortilla to the pan to warm 1-2 minutes per side. Alternately, you can wrap the tortillas in aluminum foil and warm them in the oven during the last 5-6 minutes of roasting. Garnish with freshly chopped cilantro, drizzled with lime juice and serve in a warm tortilla topped with Creamy Cilantro Lime Sauce.